Published on 25 July 2013. Yesterday, I published a review of A Series of Unrelated Events by Richard Bacon. A year ago today, I published a review of The Truth about Cruise Ships by Jay Herring. And in between the two, I’ve published some 39 other book reviews. Writing the book review section has become one of the real pleasures of maintaining this blog – I think it’s my favourite regular column. Yet, I struggle each week to summarise my review in a star-rating out of five. I often write about struggling to do this, and if you are wondering why on earth I bother, it’s because I republish versions of my book reviews in various other places, for some of which a star rating is mandatory. 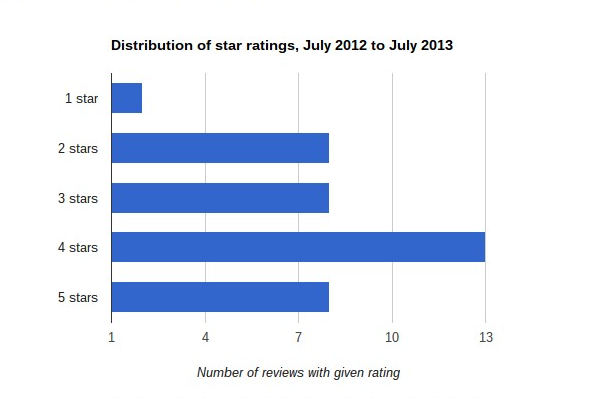 So, I thought it would be interesting to look back at the last year of reviews and look at the distribution of ratings. I’d expect the distribution to be skewed – I generally choose to read books that appeal to me, rather than ones I hate. Yet, I also try not to give out too many five-star reviews. Taking these factors into account, I’d expect the mean to come out at about 3.5. If you look very closely, you’ll notice that this doesn’t add up to the promised 41 – that’s because there were two reviews where I declined to give a star-rating, despite my self-imposed rules. It isn’t surprising to me that four-stars is the modal figure, but I am a little surprised – despite what I said earlier – that I’ve only given two one-star reviews in a whole year. I’m also surprised to have given eight five-star reviews. The mean figure is 3.4 stars, which is pretty much where I thought it would be. So what do I take away from this exercise? I’m pretty much coming up with the balance of star-ratings that I thought I would be, despite struggling every week. I am perhaps a touch too generous with five-star reviews, but, then again, the mean is where I thought it would be. I’ll repeat this in July 2014, and see if things have changed. This 2,043rd post was filed under: Diary Style Notes.